Two trips to the Final Four in two years would satisfy most college basketball players. 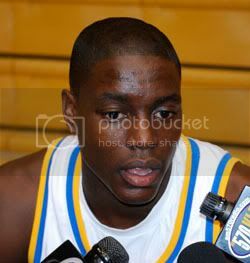 "I came to UCLA because of the basketball tradition", Collison said. "You look up at all those championship banners and you just want to be part of that tradition. I won't be satisfied if we don't win a championship this year." Collison has already left an imprint on a team that should challenge for the top spot all season. The speedy point-guard, whom freshman Kevin Love remarks as being the fastest player he's ever played with, makes the Bruin team offense go. Last season, he used his quickness in transition and to breakdown offenses while adding another weapon to his repertoire - hitting on 44.7% of his three-point shots. Prior to last season some had wondered if Collison could fill the large void left by the early departure of Jordan Farmar to the NBA, but Collison showed he was more than up for the challenge. The former Etiwanda star finished the 2006-07 campaign ranked in the top ten in the Pac-10 conference in five statistical categories. He averaged 5.7 assists and 2.2 steals a game last season and returns with Josh Shipp as the top two scorers from last season's club. With the addition of Love, and the rebounding and outlet passing that comes with his arrival, Collison is excited about the prospects of this season. "Its going to be a fun and exciting year with Kevin (Love) here." Collison said. "He's a legitimate big man inside, and along with Luc (Mbah a Moute), Alfred (Aboya), and Lorenzo (Mata-Real) who are all more mature and older now, it gives us a lot of choices and depth inside." "Kevin's outlet passes will give us some opportunities in the open court. We'll definitely use it to our advantage in transition." Collison is also thrilled by the play of sophomore Russell Westbrook, who is slated to back him up at the point and play alongside him at the two-spot at times during the game. "I think Russell Westbrook is going to surprise some people this year," Collison said of his teammate. "He brings a lot of energy. He'll give us a spark whenever he comes into a game." Along with Shipp, Collison will be looked upon to lead the team this season. Reflecting upon past players who have played leadership roles on the team during his first two years in Westwood, Collison said, "I know what Jordan brought to the table and what Arron meant to us last year, I feel its our turn to step up to the challenge." "Looking back at the last two years - it has been fun, but back-to-back Final Fours aren't good enough for us. We want to win a all." It is going to be an action packed season. Just do not play down to your competition at any point this season guys (especially non-conference)!! I love the type of players Howland recruits. All great kids, dedicated, and hardworking. Collison is jut another example of one. Thank goodness for Ben Howland! "Back-to-back final 4s aren't good enough for us. We want to win it all." My, how times have changed from the slavin years where we were relegated to printing "'back-to-back-to-back' Pac-10 champs" shirts. I love Coach Ben and I love the teams that have been under his tutelage. Praying for an injury-free season and tons of fun. GO Bruins!! !